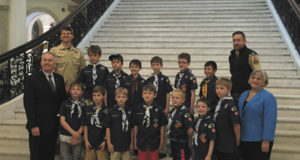 Members of Cub Scout Pack 52, Den 5 paid a visit to the Massachusetts State House recently. State Representative Denise Garlick and Senator Mike Rush greeted scouts and their adult leaders and answered questions about the building and state government by the curious Scouts. The students of the Pollard Middle School eighth-grade social studies class slumped in their desks, some still wiping the sleep from their eyes. It was a typical scene that plays out daily in every classroom across the country. First period, it seems, is a perpetual battleground between the waking and sleeping worlds, a time of the day when students are most likely to succumb to a combination of their own early morning apathy and exhaustion. Today, however, a change in routine raised some of the drooping eyelids. This morning’s class would not be taught by Ms. Gillespie, but by State Representative Denise Garlick. Rep. Garlick, accompanied by Chief of Staff Amanda Bernardo and Research Analyst Rob Reed, had come to explain how a bill becomes a law. It was a lecture she was uniquely qualified to give, and one she handled with aplomb. The lesson, however, went far beyond such procedural matters. At its heart, this was a lesson about the importance of participation in democracy. “I believe that this is one of the most important things that I do,” the Representative said to Ms. Gillespie’s class as she launched into a discussion that touched on everything from the importance of service to the inherent transparency in the legislative process to the dangers of voter apathy. “How many people in this room think that someday they might like to run for office or be engaged in public service?” Rep. Garlick asked. A single hand, belonging to a student named Nate, went up. 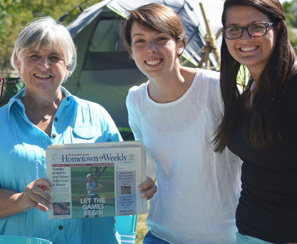 “The news, the media,” the student trailed off. Rep. Garlick confronted the issue head-on. “We’re hearing that people are refusing to do work, we’re hearing that people are disagreeing with each other. We’re hearing that it’s pretty rough in public service these days,” she said. “Not only are we painting public office and elected people, but everybody else around who’s also involved with the government, with that same kind of brush. A negative brush,” she said. “When I was in the 8th grade, we were just at the very end of the Vietnam war. John Kennedy had been president and he said ‘Ask not what your country can do for you, ask what you can do for your country.’ That’s history to you – that was my life,” she told the room. She then pivoted to the present. Beyond imparting the substance of her civics lesson, Rep. Garlick accomplished something that was perhaps equally (if not more viscerally) relevant. By appearing in Ms. Gillespie’s classroom, she managed to humanize government in a way that her students had perhaps not experienced before. In an era in which our most high-profile politicians sometimes seem to have as much in common with the Kardashians as the Kennedys, it appeared oddly jarring for the students to share the room with an elected official. Indeed, that seemed to be part of the point. 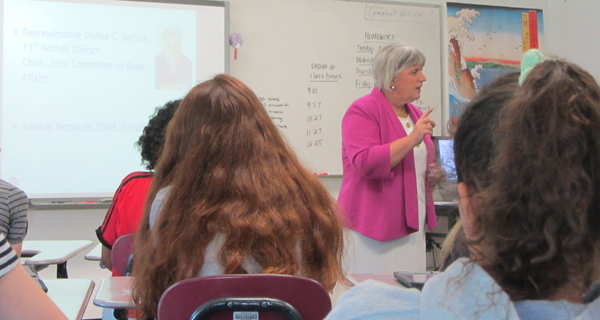 Far removed from the public figures that dominate our national discourse and news media, Rep. Garlick came off as approachable and distinctly “Needham” in her class presentation. It was a point that was not lost on the students. Or their teacher, for that matter. A family walks into the Needham Business Association Street Fair. Walking up Dedham Street towards Great Plain Avenue, a full trolley rumbles by. A breeze carries the unmistakable, tantalizing waft of carnival food – smells of popcorn, hot dogs and cotton candy seduce the senses. The American flag flaps over Needham Common, and there is nary a cloud in the sky. 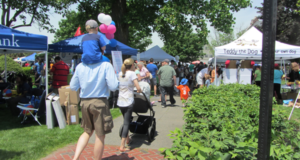 The town green is filled to the brim with vendors, activities and happy Needhamites of all shapes and sizes. This is the Needham Business Association (NBA) Street Fair, and it couldn’t have come on a more picturesque day. “The Needham Business Association would like to thank all of our members and all the Needham community that came down today to have fun with their families and to support our local businesses,” says NBA administrator Lisa Relich as she proudly looks over the Common. It certainly is a feast for the eyes. For this one day, the Common is transformed into a carnival. There are trucks, pony rides, a bouncy house and kids zone for the young ones. Inside stately Powers Hall, the Spring Arts Festival is alive and kicking with artisans presenting their unique crafts. A food court and trolley rides await visitors who could use a quick breather before getting back to the fun. Then there are the stars of the show: the vendors – 94 of them, to be exact – whose booths line the paths and walkways of the green. The NBA’s Harvest Fair, the autumn incarnation of the Street Fair, is scheduled for October 1, and promises to be every bit as exciting as its springtime counterpart. Medfield is receiving recognition as one of the Massachusetts communities dedicated to urban forest management. 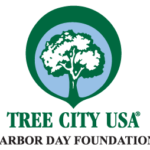 They have achieved Tree City USA status by meeting four core standards of sound urban forestry management: maintaining a tree board or department, having a community tree ordinance, spending at least $2 per capita on urban forestry and celebrating Arbor Day.